This colorful periodic table wallpaper contains each element’s normal melting point. In addition to the normal melting point, each cell contains the element’s atomic number, element symbol, element name and atomic mass. 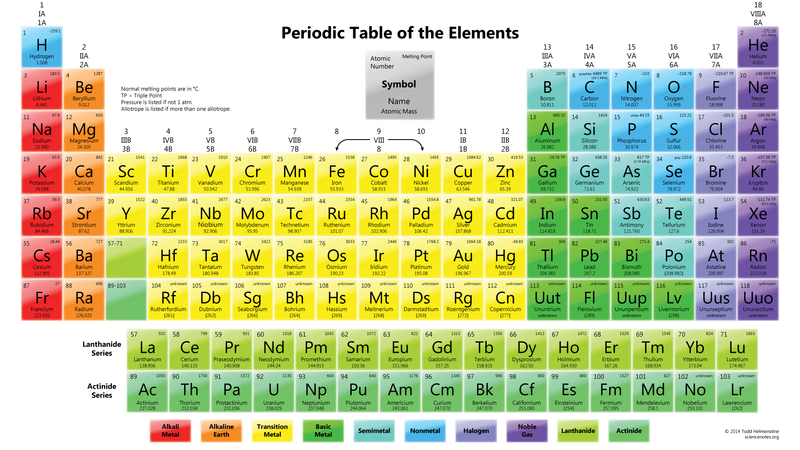 The different colors represent different element groups. The normal melting point is the melting point at 1 atmosphere of pressure. Not all elements melt at normal pressure. For these, the triple point is given with it’s corresponding pressure. This 1920×1080 HD wallpaper is suitable for all widescreen devices. Click the image for the full-sized image. A PDF version of this table is available for download or printing. If printing, choose ‘Fit’ and ‘Landscape’ as your print options. If you prefer your wallpapers to be darker, there is a black background version of this table. Reference: CRC Handbook of Chemistry and Physics, 89th Edition p. 4-133.